Storm: a violent weather condition of strong winds, rain, hail, thunder, lightning, blowing sand, snow, etc. I don’t know about you but I would not like to get stuck in a storm, I would rather be home snug under a duvet with a good book and some hot chocolate. Every one of us at some point or other face difficulties, financial, emotional, physical, spiritual whatever the difficulties, we need to put our trust in Jesus to calm the storm. 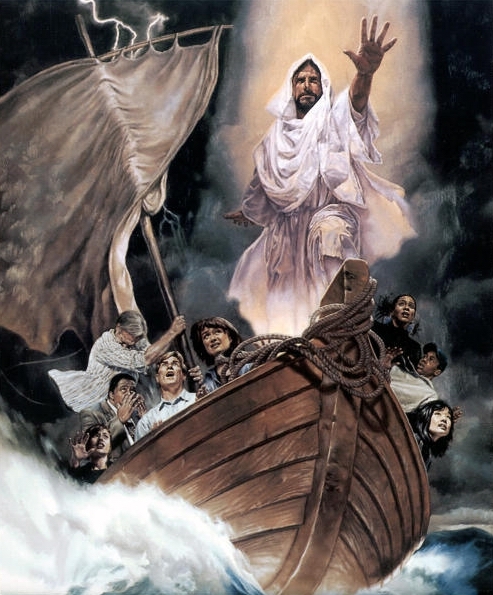 Many of us will choose to run away from it to find shelter where the storm cannot reach us, the thing is we cannot keep running, why not go headstrong into the storm, knowing that you will be ok because Jesus is with you, and will calm your storm. Matthew 8:23 – 27(the message): Then he got into the boat his disciples with him. The next thing they knew they were in a severe storm. Waves were crashing into the boat and He was sound asleep! They roused Him, pleading, “Master please save us! We’re going down!” Jesus reprimanded them. “Why are you such cowards, such faint hearts?” Then he stood up told the wind to be silent, the sea to quiet down: “Silence!” The sea became smooth as glass. The men rubbed their eyes, astonished. “What’s going on here? Wind and sea come to heal at His command. The way I see it the bible has been around for MANY, MANY years, my view on it is that it is probably the world’s number 1 best seller, why else would this book still be on the shelves of so many bookstores?? So what does this tell me?? That there MUST be truth to this book so why not use it in our everyday lives, I found an acronym the other day for the life of me I cannot remember where I found it possibly on one of the blogs I follow or perhaps on the ever so resourceful Google. BIBLE – Basic Instruction Before Leaving Earth – BIBLE now if you look at it that way how can we go wrong if we use the bible as our rule book, as our instruction manual. If you believe in your heart that Jesus can calm your storm then HE CAN, but you have TO BELIEVE. This I think is my ALL time favourite Faith scripture, in fact I wear an arm band with that scripture and ever since I bought it, it has not come off my arm. I cannot see Jesus, well not physically anyway, I can definitely FEEL him though, and I can see him working in my life and in the lives of others. So I know and have the Faith that he can CALM MY STORM and he can calm yours too. Matthew 9:18 – 27(The Message): As he finished saying this a Local official appeared, bowed politely and said, “My daughter has just now died, if you come and touch her, she will live.” Jesus got up and went with him, his disciples following along. Just then a woman who had haemorrhaged for 12 YEARS slipped in from behind and lightly touched His robe. She was thinking to herself, “If I can just put a finger on his robe, I’ll get well.” Jesus turned – caught her at it. The He reassured her; “Courage daughter. You took a risk of FAITH and now you’re well.” The woman was well from there on. By now they had arrived at the house of the town official, and pushed their way through the gossips looking for a story and the neighbours bringing in the casseroles. Jesus was abrupt “Clear out! This girl isn’t dead she is sleeping.” They told him he didn’t know what he was talking about. But when Jesus had gotten rid of the crowd, he went in, took the girls hand and pulled her to her feet – alive. The good news was soon out, and travelled throughout the region. Both the local official and the woman who touched His robe had their own storms that they were dealing with, the local official had lost his daughter and the woman had been bleeding for 12 years, but they both BELIEVED that Jesus could do what no one else could. He calmed their storms. Galatians 2:20 (NKJV) – I have been crucified with Christ; it is no longer I who live, but Christ lives in me; and the life which I now live in the flesh I live by faith in the Son of God, who loved me and gave Himself for me. James 1:3 – Be assured and understand that the trial and proving of your faith bring out endurance and steadfastness and patience. 1 Peter 1: 7 (NKJV) – That the genuineness of your faith, being much more precious than gold that perishes, though it is tested by fire, may be found to praise, honour, and glory at the revelation of Jesus Christ. Jesus has infinite power, we have very limited and finite power, there are things we can do but many we can’t. It is then that we need to look to the one with infinite power to change things that we cannot. Remember Jesus LOVES YOU, why would he let you face the storm alone.